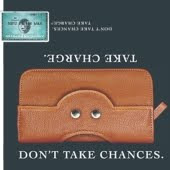 American Express launched a new campaign recently, "Don't Take Chances, Take Charge." I caught the spot on the NFL opening light last week and of course fell in love with the simple and creative use of the faces found out and about in our world. The campaign included a slew of full page adds in papers across the country. Cute huh? for kicks, here's a fabulous flickr collection of faces on everyday objects.